Soon to open its doors to the public, the Perak Agrotourism Resort is a slice of heaven in Tanjung Tualang waiting to be explored. Located just a 10-minute drive away from the Tanjung Tualang town, the resort is well-tucked away in nature, offering an unmatched sense of peace especially for city dwellers looking for a nice getaway. 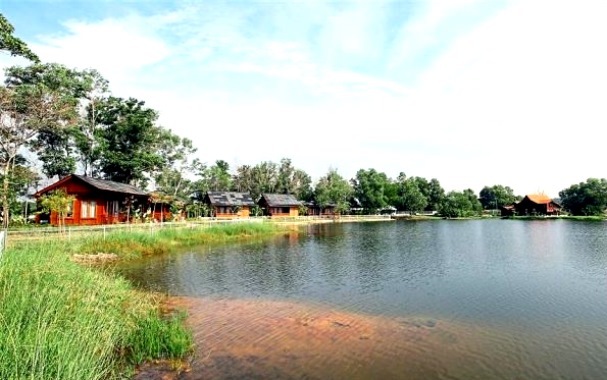 The resort, which is a project spearheaded by the Perak State Agriculture Development Corporation (SADC), is located on a 247ha site that includes scenic lakes and vast stretches of agricultural farms and plantations. 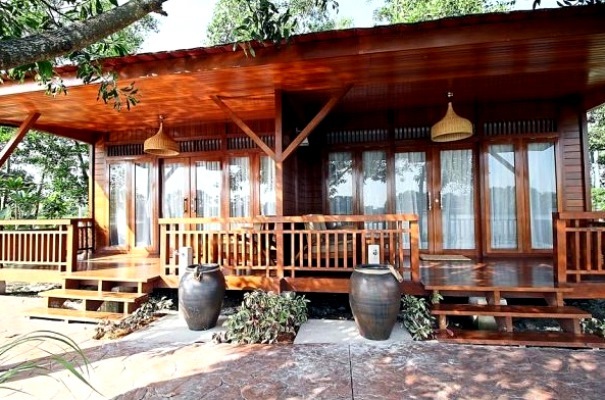 Currently, 10 beautifully designed chalets are available, including one styled along the lines of the Kutai house – a traditional type of Malay house that has been built in Perak since the 1800s. SADC CEO Datuk Ahmad Rizal Abdul Rahman said the idea to develop the land into a recreational resort for the masses stemmed from his visit to the are three years ago. “When I first came here back then during my visit to other plantations around the area, it was just a swampy area with mango trees growing naturally. “I immediately saw the potential the location had. When I looked at the natural lakes here, I felt it in my gut that other people woud love the ambience here as well if we could tap into this,” he told MetroPerak. Much like the road to greatness, it was a rough journey with a bumpy start because when Ahmad Rizal brought up the idea to his staff, everyone thought it was crazy. “Even after trying to get them on board with the idea, they would say even if it fails, I’ll die first lah. “But I saw it so clearly in my head. Why don’t we just build chalets surrounding the lakes here and create activities that can bring people back to nature? “This is something people living in the city would pay for, to the point where they are willing to spend good money to travel abroad for a nature-based experience. “We have so much natural beauty here, right under our noses, and yet we don’t know how to commercialise it,” he said. When the plan was finally put into motion last February, in collaboration with state tourism body Destination Perak Sdn Bhd, Ahmad Rizal said he made sure that everything was done in their capacity to maintain the natural ecosystem of the area. “Almost everything you see here is just as it was before the construction work started, and that includes the lotus ponds and greenery,” he said. But, as the area was once a tin mining site, Ahmad Rizal said SADC had to rehabilitate the land beforehand to make it fertile for the planting of fruits and vegetables. “We will be planting many types of crops, such as corn, banana, sugar cane, dates, the herb misai kucing, tumeric, watermelon, sweet potatoes, among many others. “The idea is that when people come here, they will be able to enjoy the whole back-to-nature experience by harvesting the crops to eat or cook during their stay here,” he said, adding that about RM20mil was needed to fund the entire project. Once the plantations and farms have fully grown, the resort area will then be a treasure trove of SADC’s produce, which would also be marketed under its agro-based products brand Pegro. Besides this, Ahmad Rizal also said that the resort will be an educational hub built around the concept of edu-eco-agrotourism. “The combined elements of education, ecology and agriculture here is how we can educate our guests and tourists on everything related to Perak agriculture. 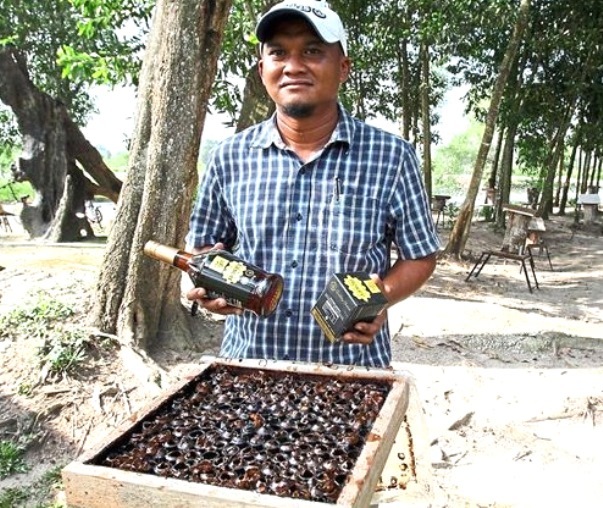 “For example, those who want to know the origins of Ipoh city’s name, we are working on planting some Pokok Ipoh here so people can learn and see this iconic local tree in the flesh,” he said. Also planted within the resort for visitors to see are over 100 different types of herbs used to making SADC’s own cosmetic line Forest Secret. In the Forest Secret Herbs Garden area just opposite the chalets, one can learn the names of many traditional Malay herbs and their medicinal properties, like jasmine, tembaga suasa, pecah kaca, ganda rusa, to name a few. Another attraction at the resort is the honey production, with stingless bees. The bees’ hives are located around the area. So harmless are these insects that guests and tourists can be given straws to attempt sucking out some of the sweet honey, said to be twice as nutritious as ordinary honey, straight from the honey combs in the hives. Children and animal lovers will enjoy visiting the deer farm and petting zoo, where they can get up close with cute critters like rabbits, quails, birds and peahens. Other things guests and tourists can look forward to at the resort include learning the process of making salted duck eggs, and how to create an “edible garden”, where instead of planting flowers, herbs and vegetables such as basil leaves, eggplant, belalai gajah, and turmeric are cultivated for kitchen use. 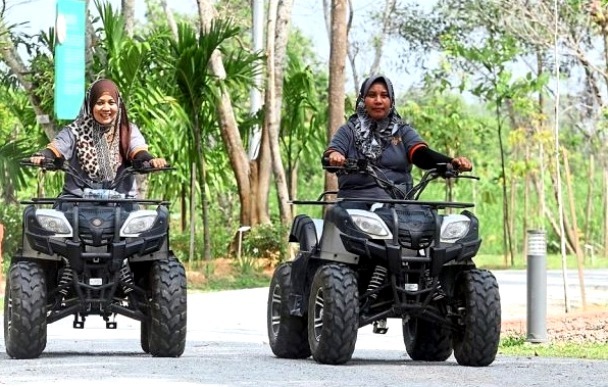 City folk with a taste for adventure are invited to visit the resort and try out its outdoor sports activities, especially the all-terrain vehicle rides. “We have a 3km ATV track which takes riders around our breathtaking lakes on bumpy, sandy tracks shaded by trees. “Other than that, leisure activities like biking, kayaking, paintball, and archery will be available as well. We will divide these activities into different packages to cater to the interests of different groups,” Ahmad Rizal said. He added that he came up with these activities to appeal to families as well, especially the families of fishing enthusiasts. “We have a few lakes around here where freshwater fish and prawns are growing healthily, so this is where those who love fishing can come here to enjoy their pastime. “With the other activities available here, their families can also have a good time here and enjoy what we have to offer,” he said. Ahmad Rizal pointed out that anglers can also look forward to catching giant freshwater prawnd, a species Tanjung Tualang is famous for. “At our Lakeview Cafe, which is still being constructed, people can bring in the fish and prawns they catch from the lakes for our chefs to cook. “Once the cafe is ready, people can come here to savour local kampung-style dishes like pais ikan and gulai lemak cendawan sisir,” he said, adding that the cafe will be open to the public and not just resort guests only once it is ready. Apart from just being a retreat for people, Ahmad Rizal said the resort will also will provide job opportunities among the locals from Tanjung Tualang and Kampung Gajah. “We are looking at working with highschool dropouts. Just because they drop out of school, doesn’t mean they do not have the chance to contribute to society. “We have a training centre for them, where they are exposed to various sectors of agriculture, and they can then choose which sector they would like to be trained in according to their interests,” he said. The resort is expected to be open by the end of July, after Hari Raya.